I’m a virgin. You must be gentle. I’ve been putting this off for a while. I don’t know why, exactly. It’s a commitment, at least it seems like it is, & I fear those. But I’m certainly not up to sending individual, personalized e-mails to everyone I know who might be interested in this stuff, so this is better, I guess. I’ve got a lot of stuff to share. From now & before. This is gonna be kinda jumbled & totally non-linear at least for a while. I hope it’s not gonna be too tedious, for you, gentle reader, nor for me, your humble servant. I don’t know why I’m finally starting this now. Not because it’s almost Christmas. I hate Christmas, but we won’t get into that just now. 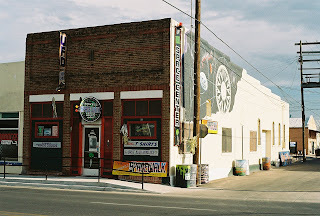 So this is our shop, well, it’s the store in front; The Roswell Space Center, where we sell Roswell T-shirts & alien tchotchkes. Inside is the Roswell Spacewalk, our roadside attraction (it’s a walk-through blacklight trip through time & space art installation, more on that later). 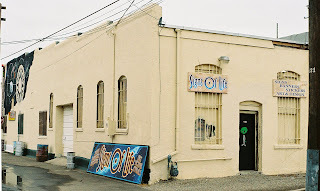 Our sign shop; Signs Of Life [in Roswell] is in the back, & upstairs way in the back is my studio/workspace/hideout place. That’s where I’m doing this. Where I do my magic, such as it is. That’s our sign from the place we were at before, 1 mile west of here. It’s 4×16 feet & weighs about a half a ton & is currently up on the roof facing the sky. Soon it will be hanging over the roll-up door. That will be better. Here’s our new (to us) house that we’re still moving into. It’s in town. We were out in the sticks before. It’s nice, a good location for having to show up for work at a shop ‘downtown’ every day. It’s not nearly large enough to hold all of our stuff, which is a bit of a problem. We have a lot of stuff. This entry was posted in house, shop, store on December 23, 2006 by admin.